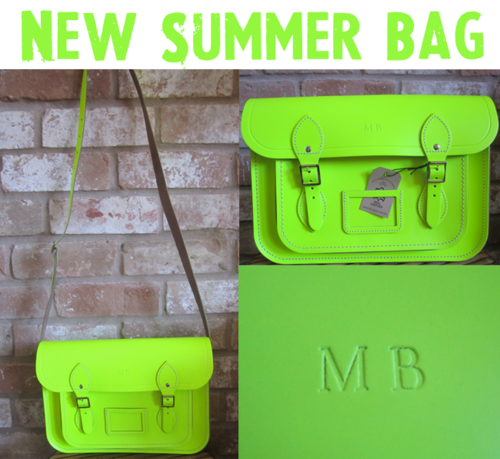 After waiting in anticipation for exactly three weeks, my Cambridge Satchel Co. fluorescent yellow satchel hasfinally arrived!!!! I could not be more thrilled with how it turned out! It looks much brighter in pictures than it does in person, but it is still quite shocking – I couldn’t be more obsessed with it. So splendidly bright, yet simply structured, this bag is sure to be my #1 accessory this summer. It is a total must-have and has been featured everywhere from Vogue to the uber chic blog, Fashion Squad. I got mine in Fluorescent Yellow in the 13” size, which is perfect for me, but they have larger and smaller sizes to choose from. It also comes in Fluorescent green, pink and orange as well as colors with less shock value like purple, green and mustard yellow.